Hydraulic power pack unit uses a standard range of modular component for easy specification, assembly and maintenance in the most demanding industrial application. It comes with a change over valve that can be adjusted without any tools and with graded scale to easily see the working pressure of the installation. 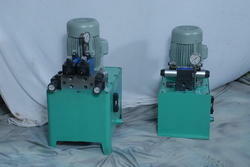 Hydraulic Power Pack releases the power of 5.5 KW without Fluctuation. This machine produces the working pressure of 20 MPA equipped with 2.0 oil tank having a capacity to fuel in 80 L at a go. The machine is manufactured under the supervision of deft professionals who utilize innovative technology. Easily adjusted change over valve.